Did you oversleep this morning? If you live in the United States of America, Monday morning seems to have arrived just a bit earlier, accompanied by a bit more "dark" than usual. That's because as good time-fearing citizens, we have all set our clocks ahead by one hour so as to conserve more daylight for the end of the day. It means that on Saturday night/Sunday morning, we give up an hour of sleep. We also lose additional time as we wander around our houses and set our many dozens of clocks ahead by 60 minutes. Several years ago, in an effort to save my clock-setting labor, I purchased one of those "never-have-to-set-it-again" alarm clocks. It featured an internal battery (to guard against power outages) and sophisticated circuitry that already knew about Daylight Savings Time. With this new clock, I would never have to worry about waking up too late (or too early) on the two designated Sunday mornings each year. But guess what? Shortly after I bought the clock, Congress changed the Laws of Time and effectively extended DST by about a month. My "smart" clock was now remarkably stupid. 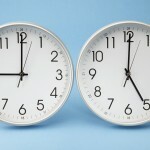 Not only did it fail to automatically adjust the time when it was supposed to, but it actually continued to adjust the time according to the old schedule, thus interfering with my sleep patterns on two errant weekends per year while offering no help on the "official" time-change dates. John D. Cook says that "DST is a huge mess", and for a while in my household, it was extra messy. Now I try to make sure that every new clock that I buy can connect to the Internet. Why? 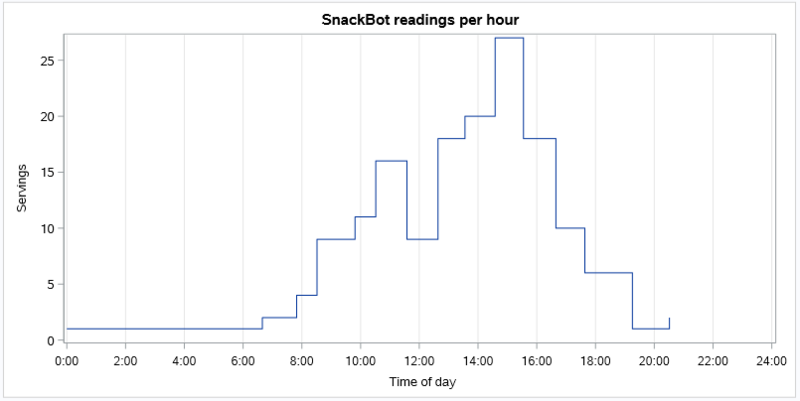 Because Internet-connected devices track time in UTC, and not in local time. For display purposes, our devices provide the arithmetic service of calculating the UTC value into "local" time. And although that formula might change a couple of times per year (UTC-5 instead of UTC-6), the devices take care of all of that for me. UTC is used for most computer-related activity that features time stamps, thus providing an objective measure of time without local bias. But sometimes we encounter data that doesn't use UTC and we must adjust our analysis accordingly. That's why it's important to know how to calculate the UTC offset within your SAS programs. 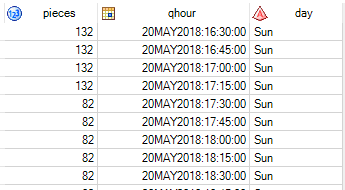 And you can also use SAS to plan ahead, and note exactly which future Sundays will be affected by DST. That is, until the DST debate results in more changes. Like millions of other Americans, I recently was asked to make a decision of tremendous importance to my household -- a decision that would affect the welfare of everyone in my family. That decision, of course, was whether to continue to receive Netflix movies by mail, or opt for the less-expensive "streaming only" subscription. Let me just say this up front: we love our Netflix subscription. We subscribed way back in 2005 on the low-cost "one-disc-at-a-time" plan, and since then we've seen over 180 movies that we received on-loan, delivered via the US Postal Service. Many of these were movies that we never would have seen otherwise: older films, independent films, and many other titles that would have been difficult to find at a local video rental shop. 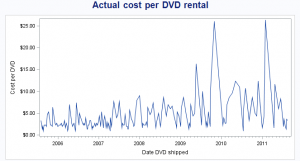 But having arrived at this crossroads, it's a good time to try and measure just how much the DVD-by-mail option would cost us, and then we can decide what action to take. 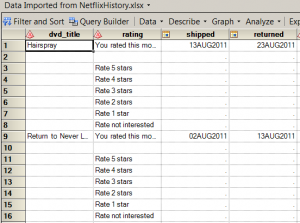 And of course, I used SAS Enterprise Guide to analyze my Netflix history, and thus created additional insight about the movie-rental pattern of my household. In order for that URL to work, you must be already signed in to your Netflix account in your web browser. While there are several ways to turn this web page into data, I found the easiest method within Microsoft Excel. On the Data ribbon menu, select Get External Data->From Web. On the New Web Query window, paste the URL in the Address field and click Go. You'll see a preview of the web page where you can select the table of your account history to import as data. 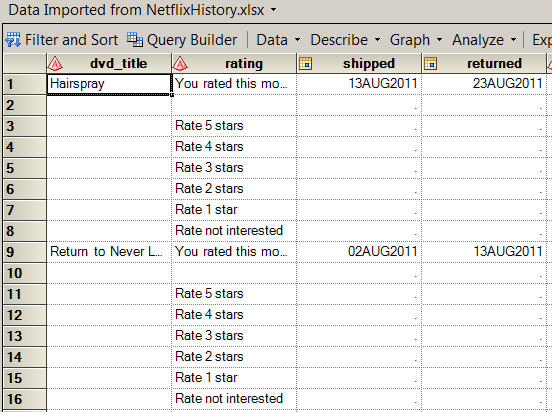 When the content is transferred into the Excel spreadsheet, I saved the file (as NetflixHistory.xlsx), and closed Microsoft Excel. The spreadsheet doesn't look like data that's ready to analyze yet (lots of extra rows and space as you can see in the example below), but that's okay. I can fix all of that easily in SAS. 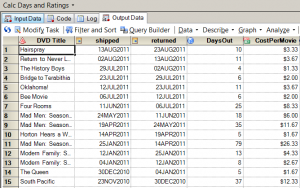 With the data now in an Excel spreadsheet, I fired up SAS Enterprise Guide and selected File->Import Data. 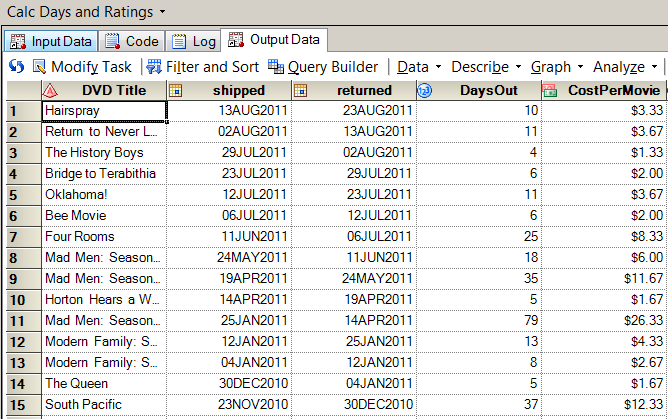 After just a few clicks through the wizard, I've got the data in a work data set. 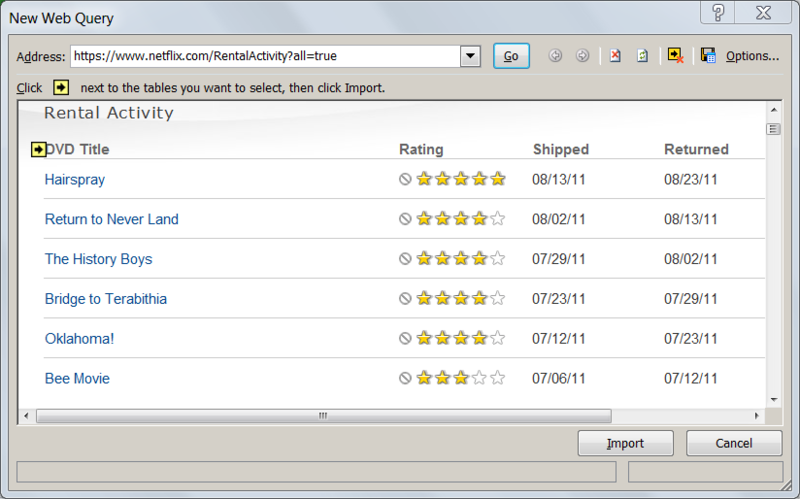 The data records for the account history are very simple, containing just four fields for each movie: DVD_Title, Rating (whether we liked it), Shipped (date when Netflix shipped the movie out to me), and Returned (date when Netflix received the movie back from me). My goal for this project is to measure value, and there are no measures in this data...yet. I also need to filter out the "garbage" rows -- those values that had some purpose in the HTML page, but don't add anything to my analysis. 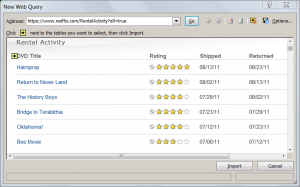 The first three filters will drop all of the rows that don't contain information about a DVD title or shipment. The last two filters will drop any records that reflect multi-disc shipments, or the occasional replacement shipment from when I reported a damaged disc. Those are rare events, and they don't contain any information that I need to include in my analysis. Next, I want to calculate some measures. 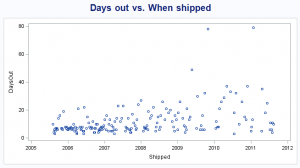 The most obvious measure to calculate is "How many days did we have the movie" -- the difference between the Shipped Date and Received Date. And while that number will be interesting, by itself it doesn't convey value or cost. I want a number that I can express in dollar terms. To come up with that number, I will employ the tried-and-true method used by data hackers all over the world: I will Make Something Up. 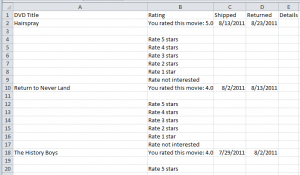 By sorting this data by CostPerMovie, I can see that the "cheapest movies" were those that we had out for only 3 days, which is the fastest possible turnaround (example: receive in the mailbox on Monday, watch Monday night, mail out on Tuesday, Netflix receives on Wednesday and ships the next DVD in our queue). 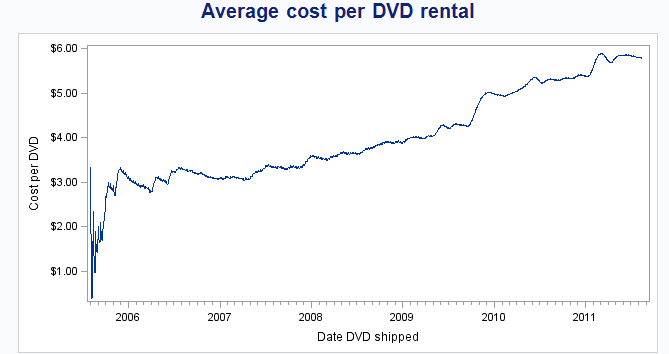 By my reckoning, those DVDs cost just $1 to watch. The most expensive movie in my list came to $26.33, a Mad Men DVD that sat for 79 days while we obviously had other things to do besides watch movies. 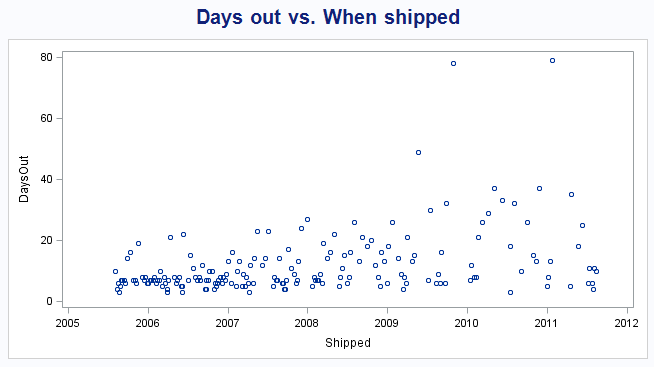 To visualize the "Days Out" as a time series, I used the SGSCATTER procedure to generate a simple plot. You can see that at the start of our Netflix subscription, we were enthusiastic about watching the movies immediately after we received them, and then returning them in order to release the next title from our queue. These are where the DaysOut values are closer to zero. But as time goes on and Life Gets Busy, there are more occurrences of "extended-period loans", with higher values for DaysOut. Calculate the moving average of the CostPerMovie over each 10-movie interval, in an effort to "smooth out" the variance among these values. 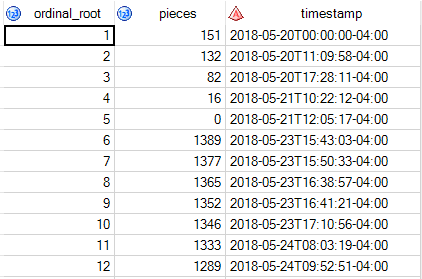 Interpolate the CostPerMovie value for all dates that are covered by these data, so that on any given day I can see the "going rate" of my CostPerMovie, even if that date is not a Shipped Date or Received Date. 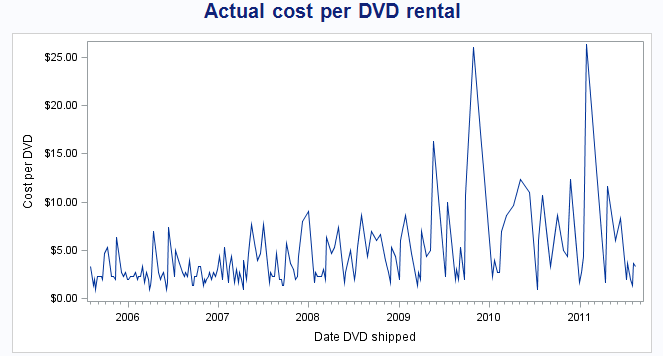 This plot confirms what I already know: our movies have become more expensive over the past 6 years of my subscription. But more importantly, it tells me by how much: from an initial cost of $3-4, it's now up to nearly $6 per movie -- based solely on our pattern of use. 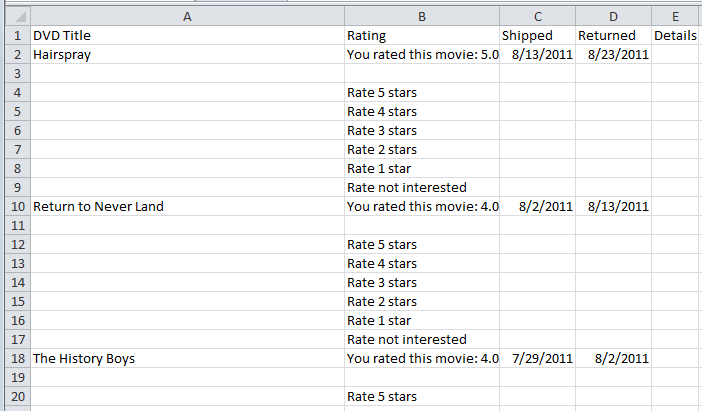 Important note: The data I collected and analyzed covers only the DVDs we've had shipped to us. It does not include any movies or shows that we've watched by streaming the content over the Internet. The "instant watch" feature is an important component of the Netflix model, and we do use this quite a bit. 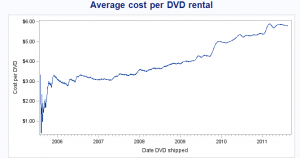 I know that this accounts for much of the decrease in frequency for our DVD watching. But by changing their pricing model, Netflix basically asked the question: how much is it worth to you to continue receiving movies by mail, independent of the streaming content?